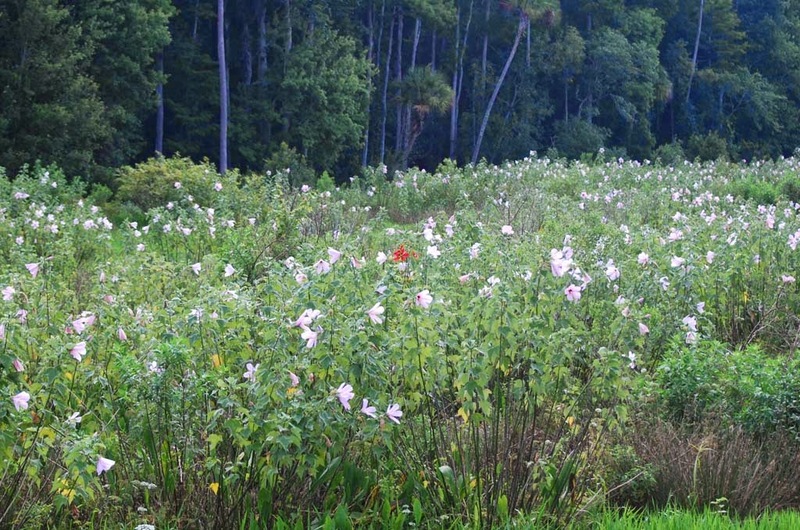 Extensive fields of blooming swamp rosemallows can be seen now in the wetlands on the east side of I-95, several miles south of SR 520, and in the marshes where SR 520 crosses the St. Johns River. 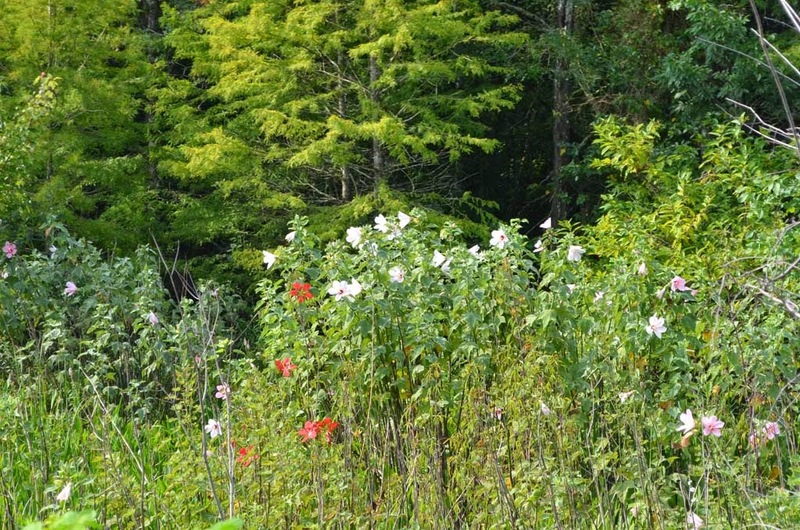 The blooms are especially beautiful with the early morning sun behind them. 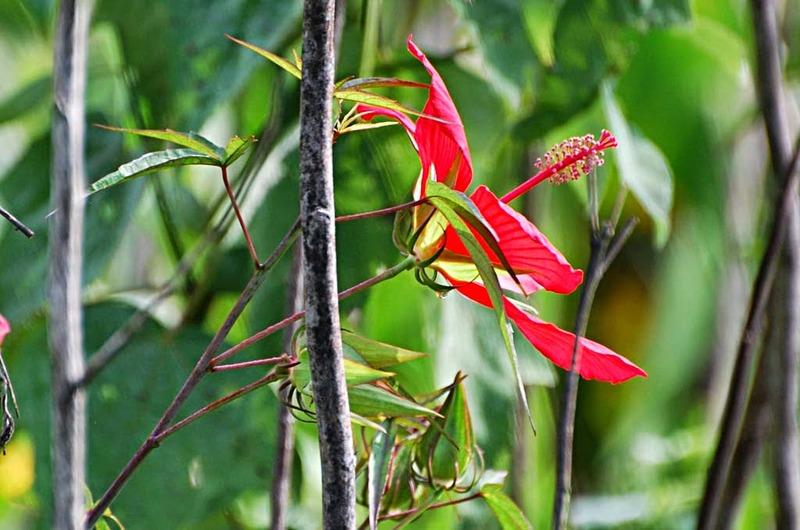 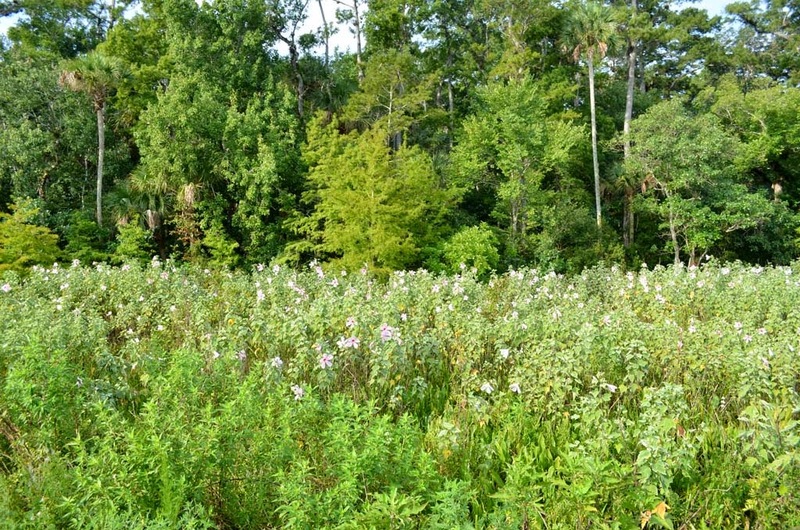 We figured they would also be blooming in Tosohatchee WMA, so we decided to photograph them. 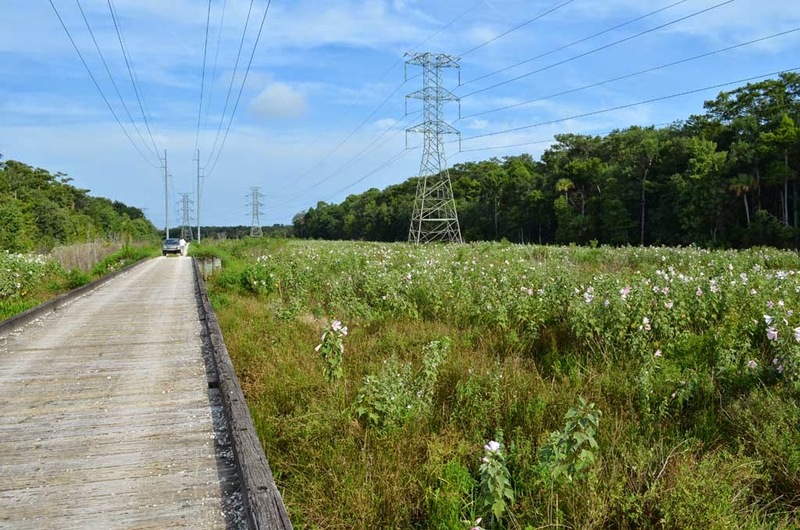 All photos were taken along Power Line Rd, at the two wooden bridges and east towards the St. Johns River. 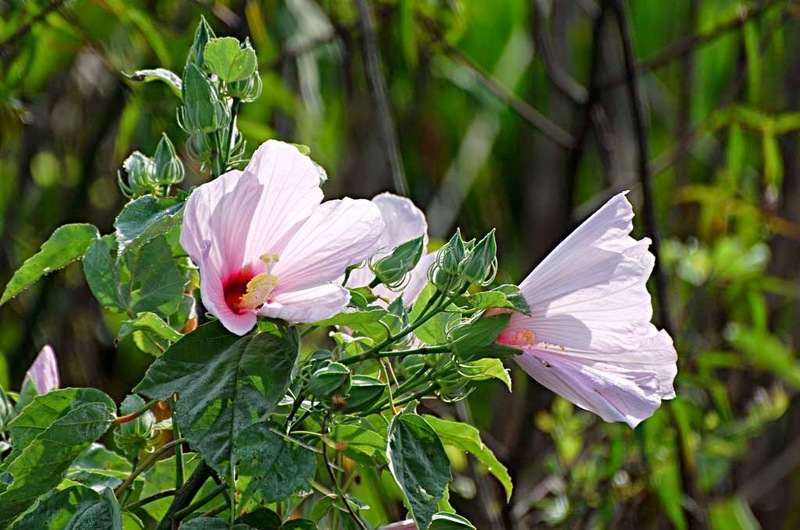 All three are Florida natives and are in the Malvaceae family, which also includes okra, cotton, and several cultivated hibiscuses. 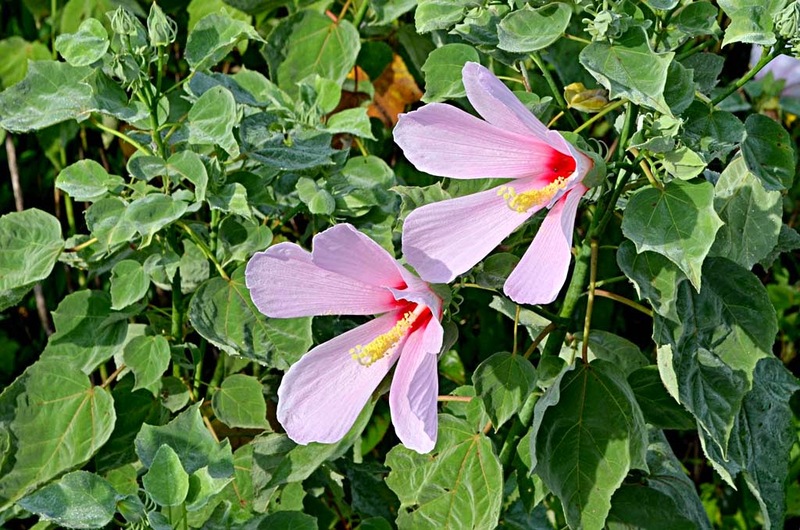 Swamp rosemallow is a big herbaceous perennial, sometimes reaching 10 ft or more in height, and often developing a semi-woody stem near its base. 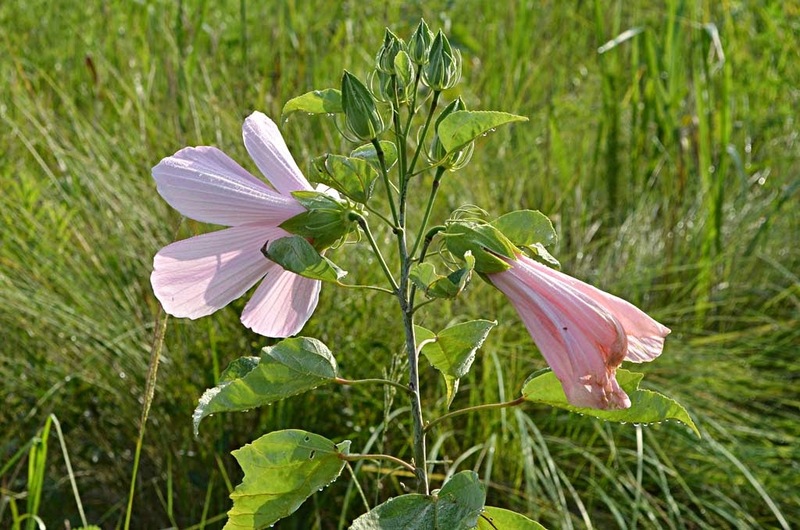 The spectacular flowers open in the late afternoon and are finished by noon the following day, but a succession of blooms (up to a dozen or more per plant each day) keeps up the show from mid-summer through autumn. 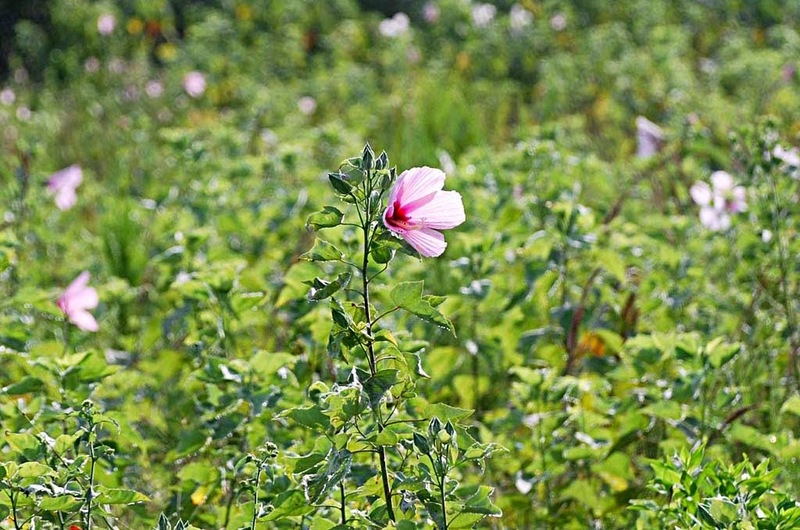 Swamp rosemallow plants grow bigger each year by adding additional stalks from its root crown. 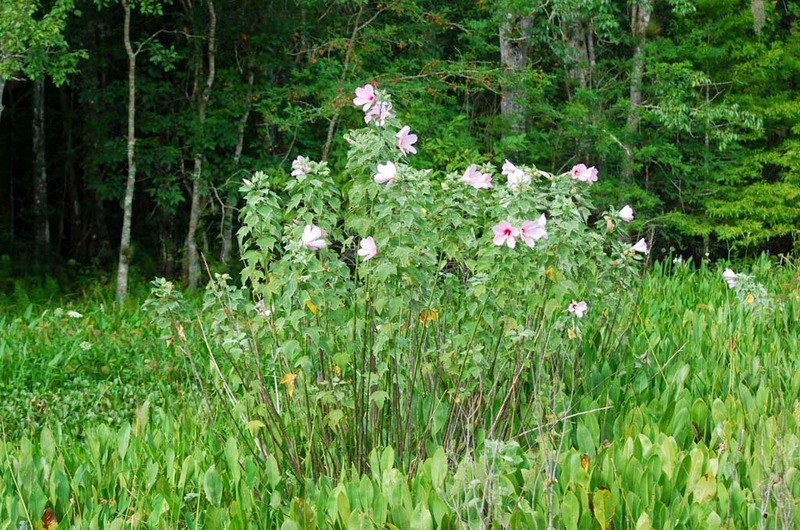 As many as a dozen stalks may arise from a root crown 2-3 ft across. 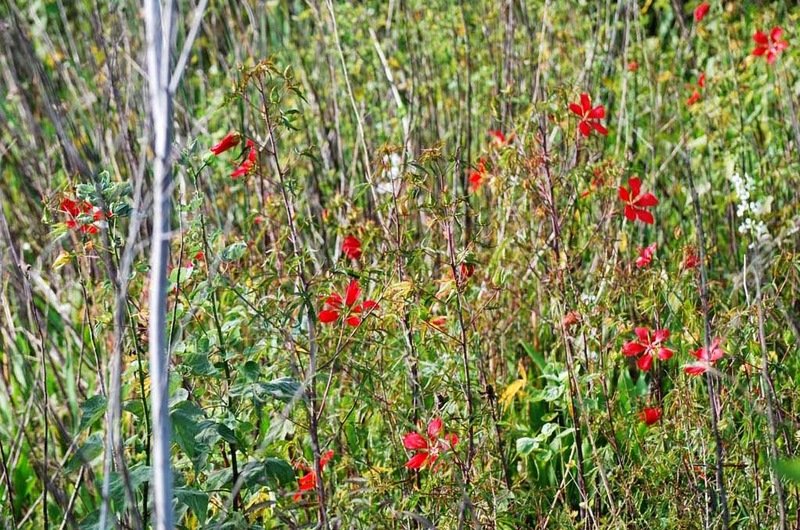 Scarlet rosemallow, which often shares a wetland with swamp rosemallow, is a slender shrubby herbaceous perennial that dies back in winter and re-sprouts in spring. 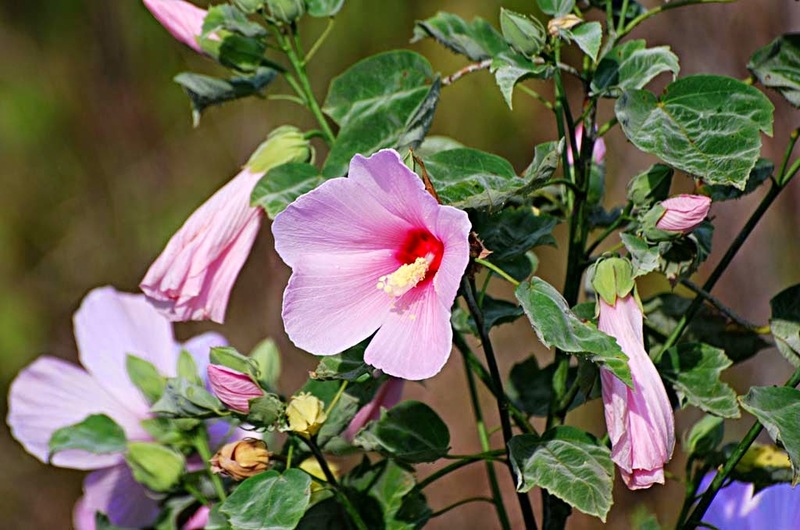 Established plants can have one to several stems up to 7-ft tall. 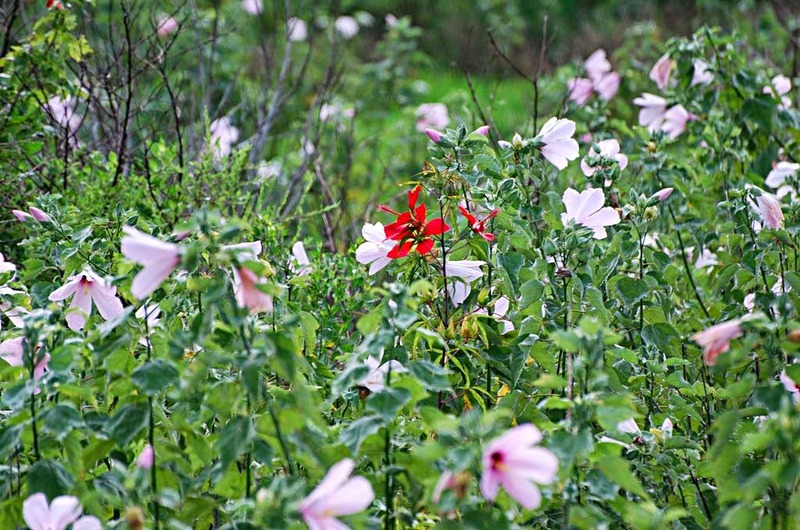 The five petaled flowers are brilliant crimson red and 6-8 in across. 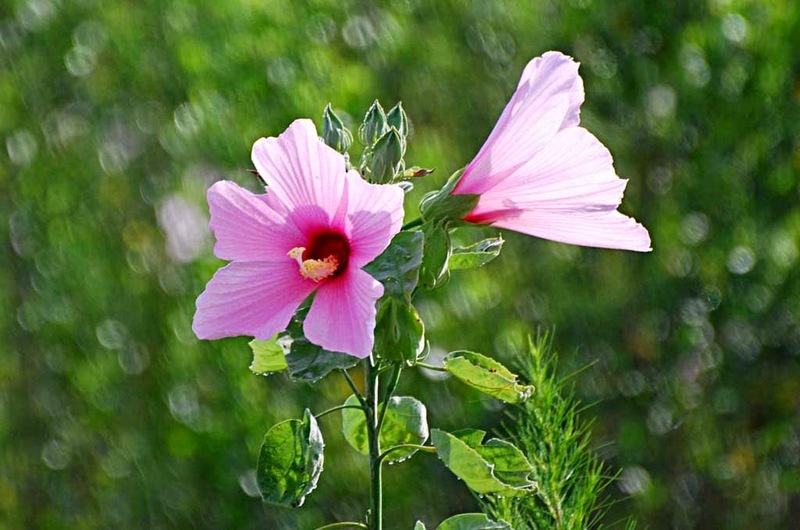 Each lasts only a day but new ones continue to open all summer and fall. 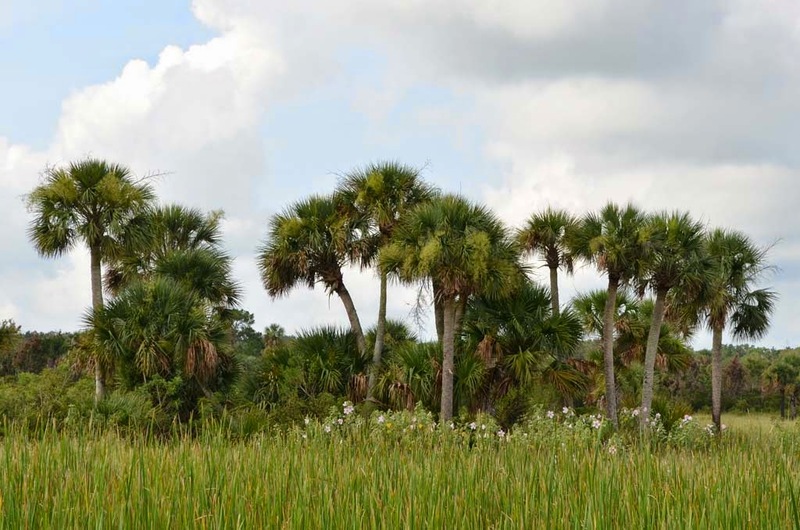 The leaves are divided palmately (like the fingers on a hand) into 3-7 narrow, pointed, serrated lobes. 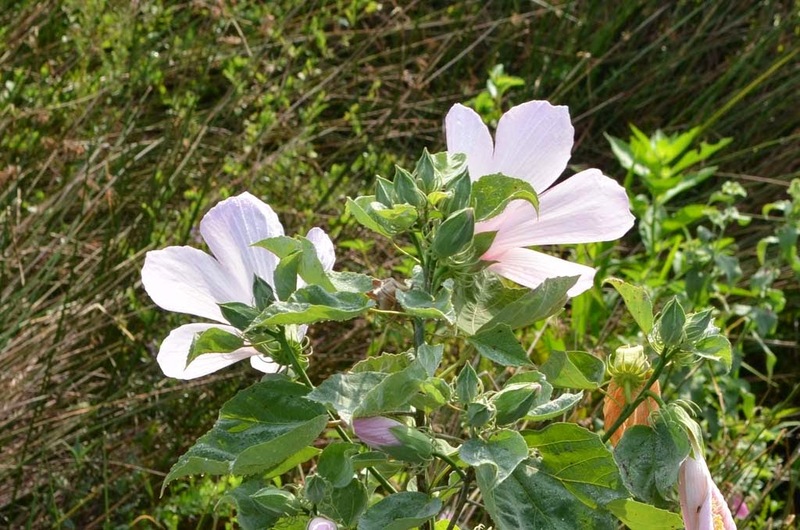 Virginia saltmarsh mallow is a common occurrence in salt marsh and freshwater wetland habitats throughout Florida and the Eastern Seaboard. 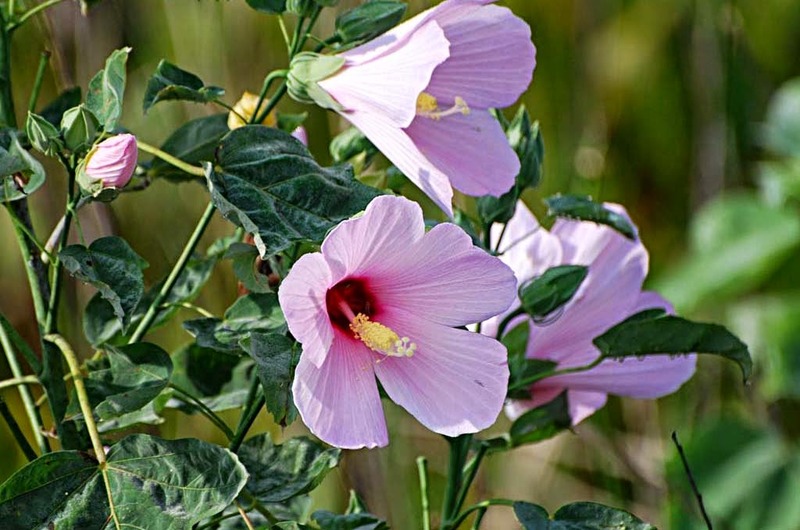 Saltmarsh mallow is a deciduous perennial that emerges each spring and produces a thin, weak stem that eventually reaches a height of up to 6 ft. Blooming can occur during most months from late spring through fall. 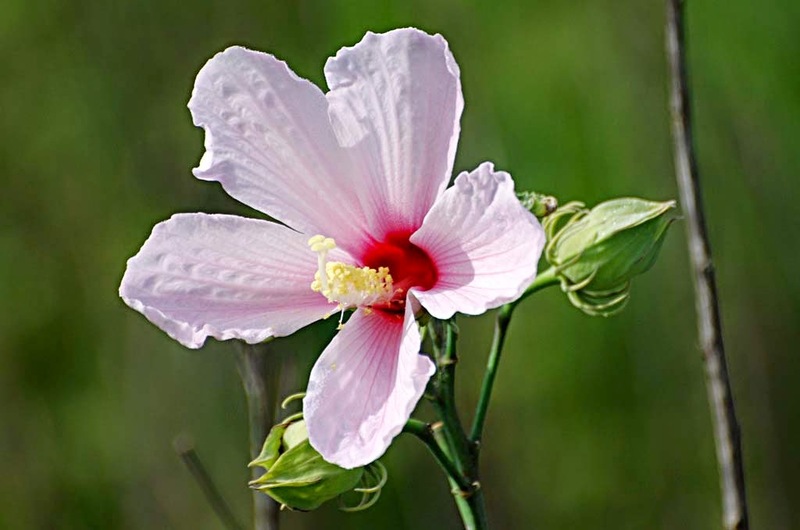 The individual flowers are small by native hibiscus standards, 1-2 inches across, but a wonderful rich pink in color. 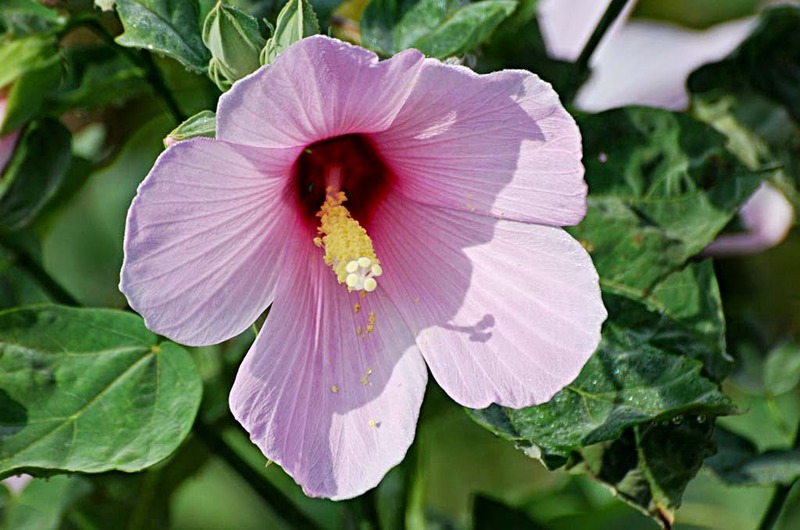 These flowers are attractive nectar sources for a wide variety of pollinators. 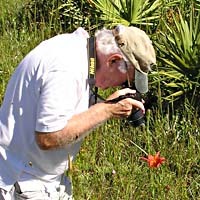 Section 1. 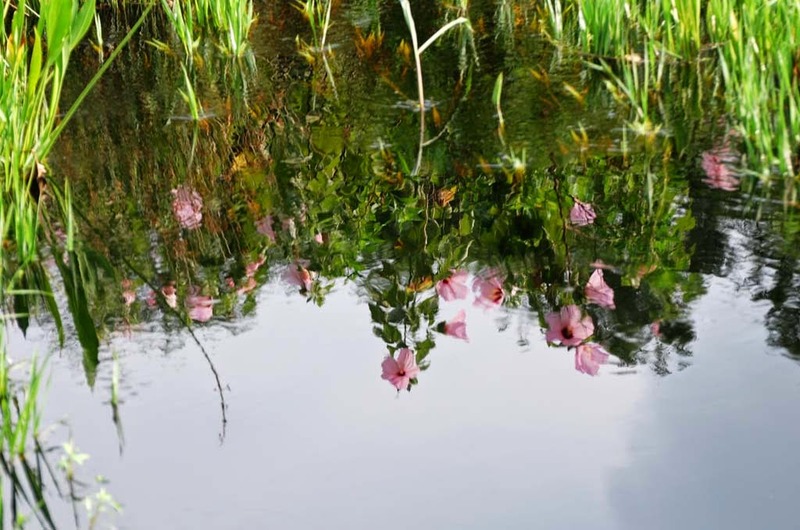 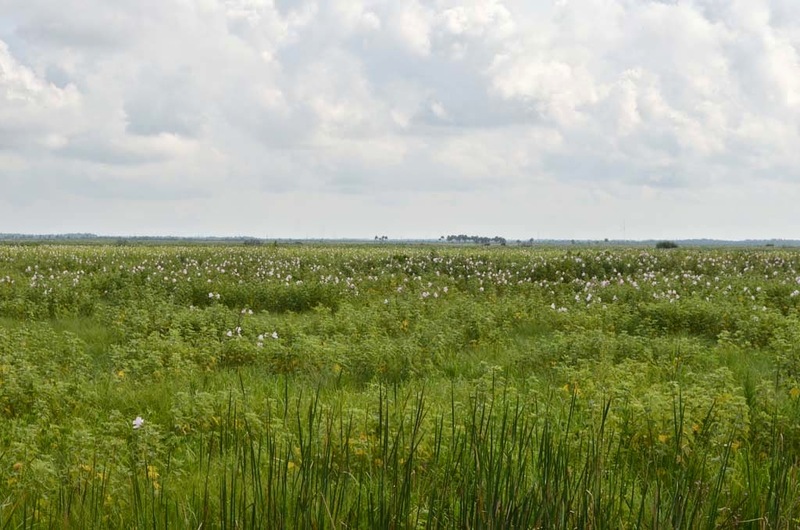 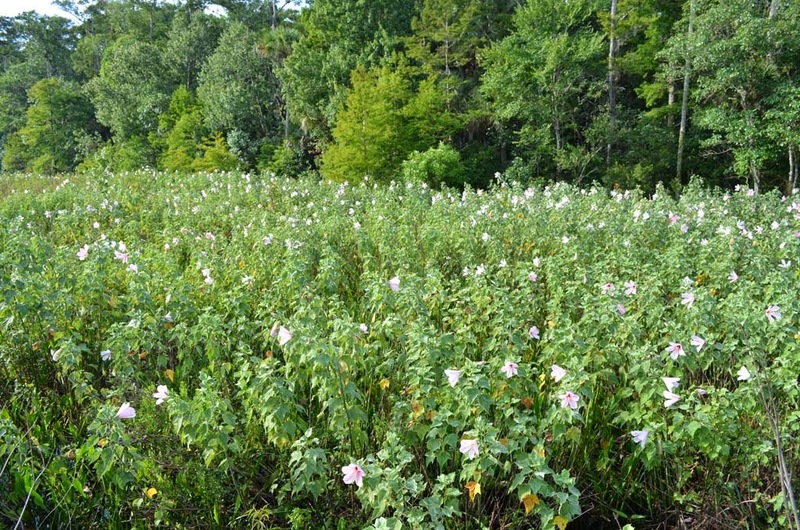 Swamp rosemallows, wide-views. 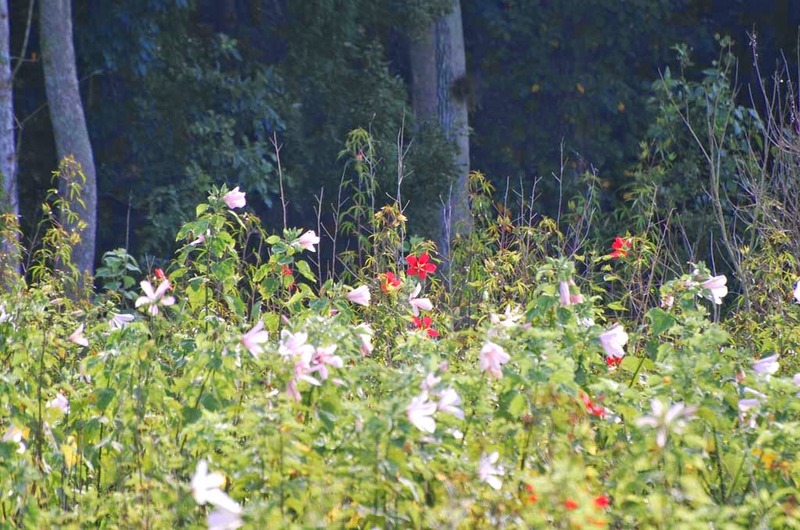 The flowers appear to be at their peak. 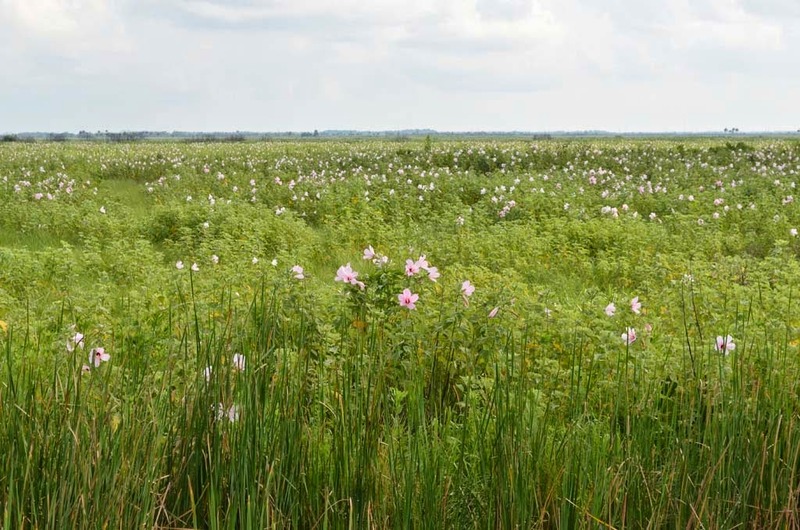 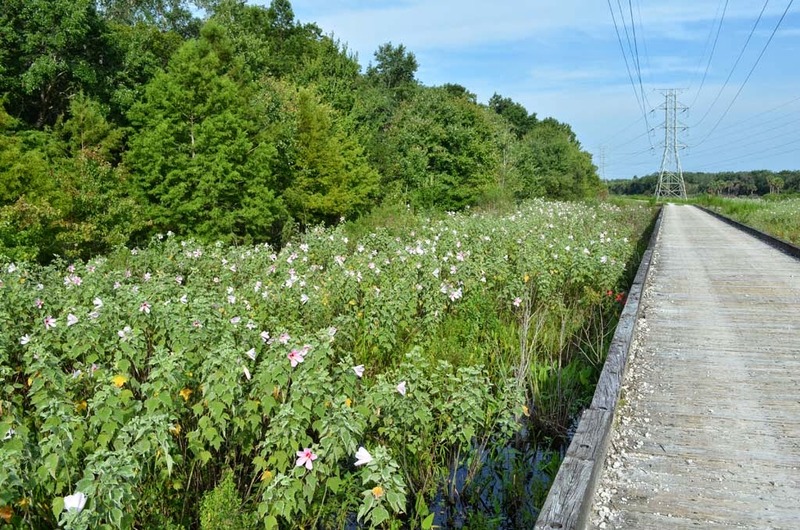 As we drove east on Power Line Rd, we found large fields of swamp rosemallows at the two wooden bridges. 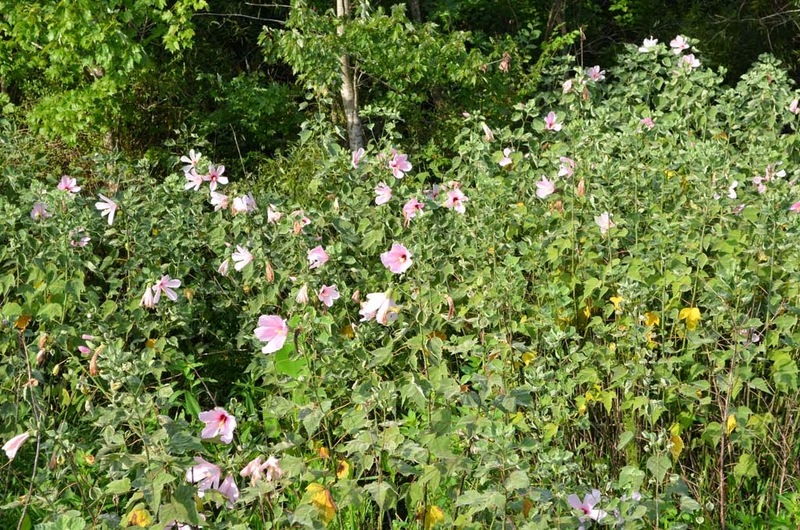 The space between the road and the woods were filled with rosemallows. 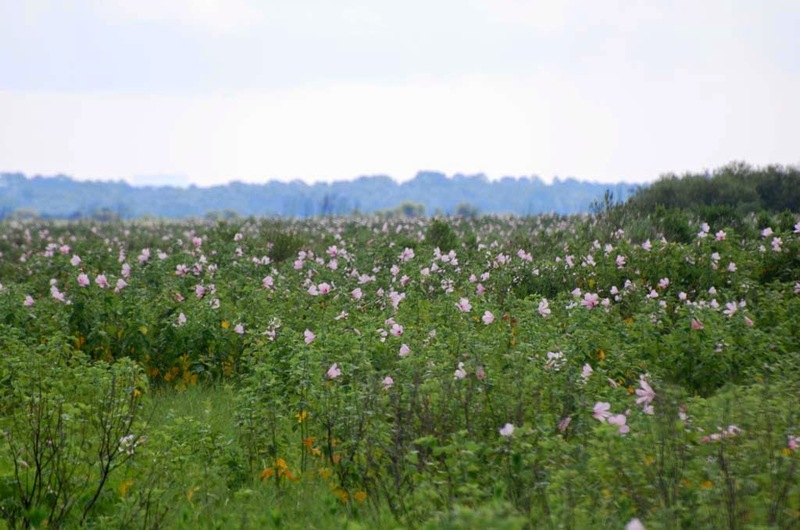 As we left the wooded area and came into the St. Johns River flood plain, the rosemallows seemed endless; they filled the treeless plain and faded into the horizon. 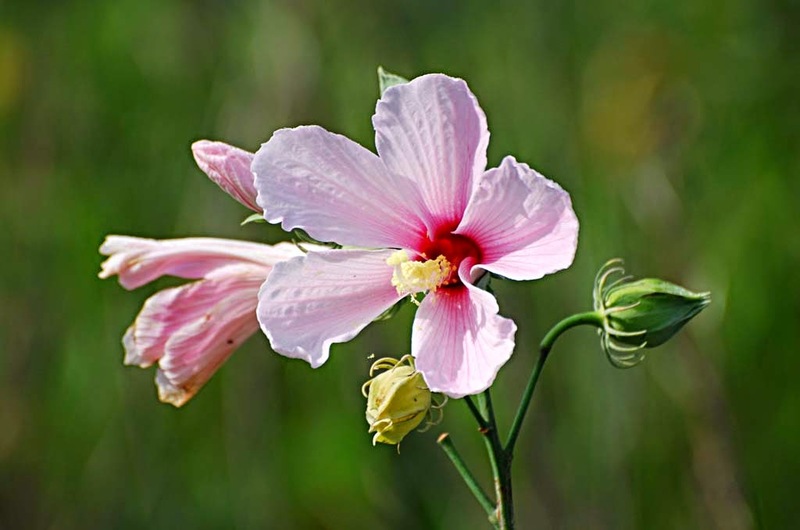 Section 2: Swamp rosemallows, medium-views. 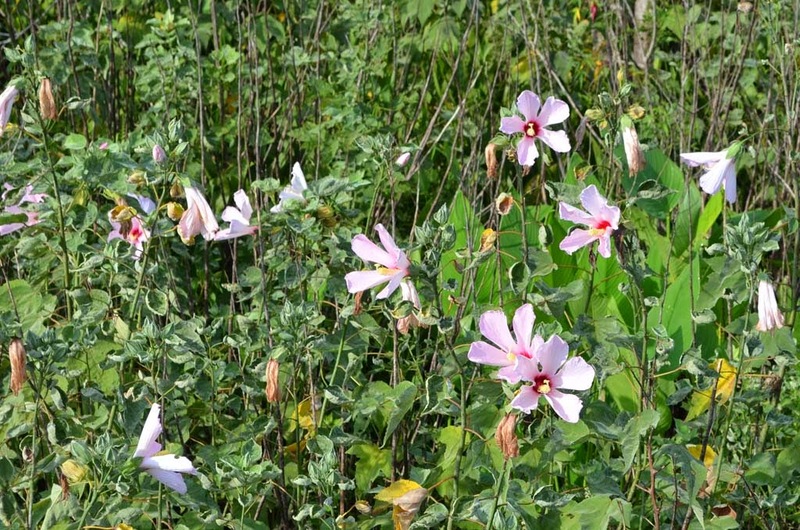 This second section shows several medium-view shots of the rosemallows. 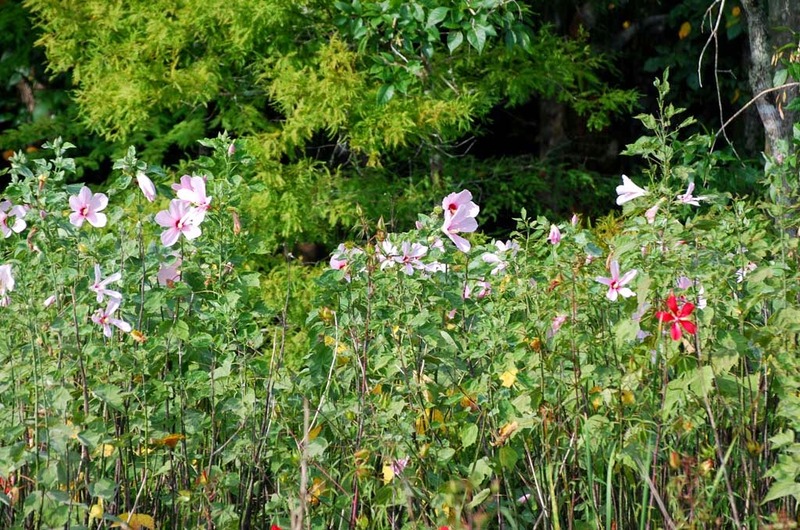 The picture on the right shows how the rosemallows grow in clumps. 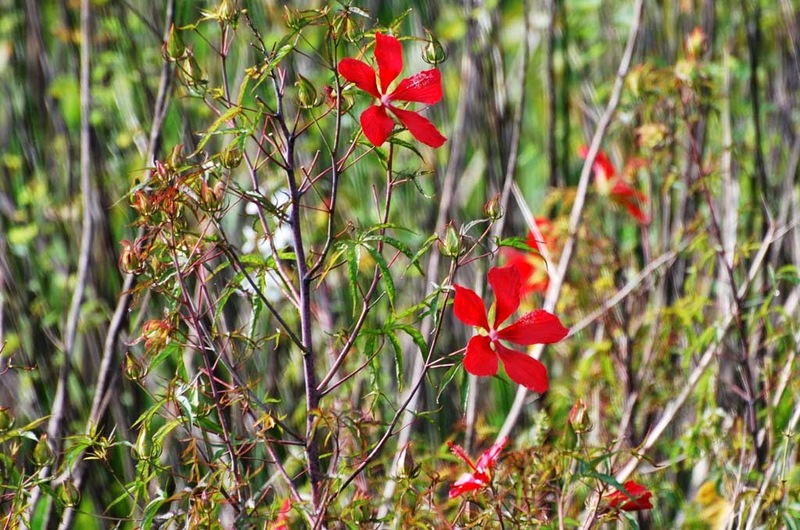 The woody stems from last year's growth can be seen. 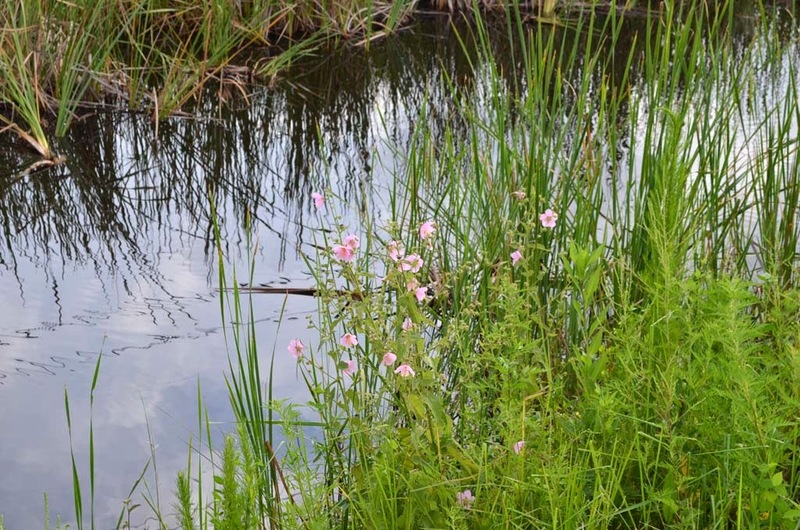 Section 3: Swamp rosemallows, close-ups. 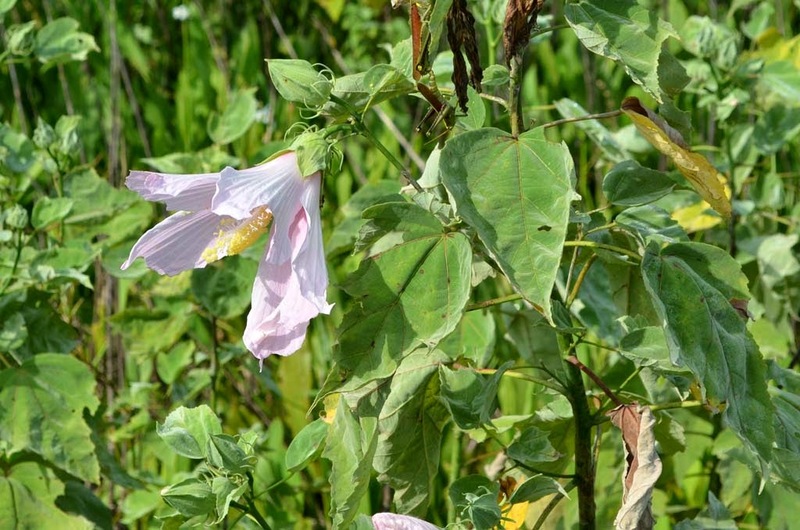 Leaves are alternate, green-gray, heart-shaped, 3-lobed, and toothed. 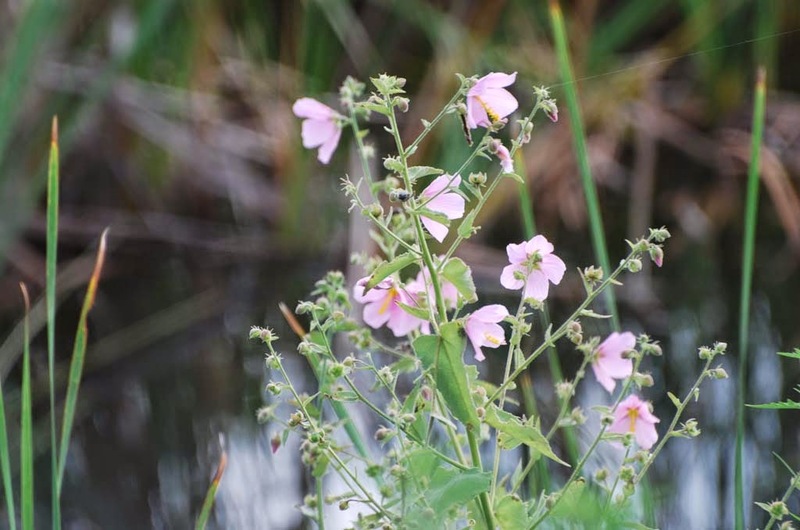 The many linear bracts seem to form a spiral-shaped basket to hold the blossoms. 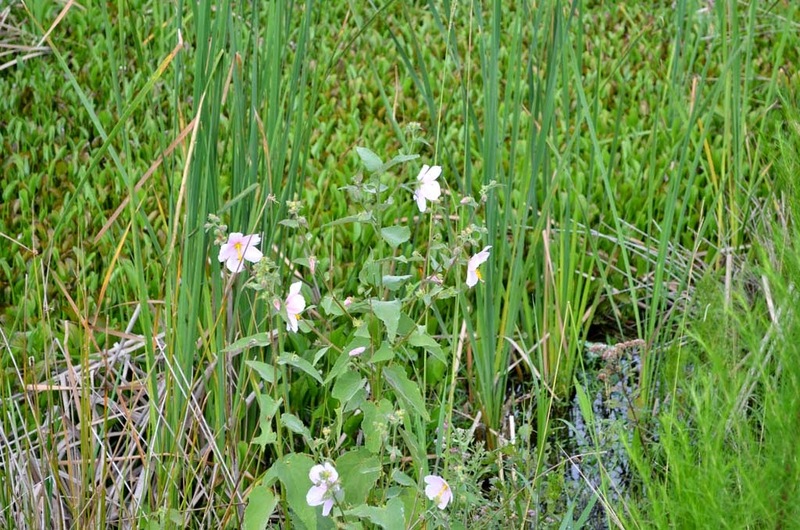 A few blossoms are almost white. 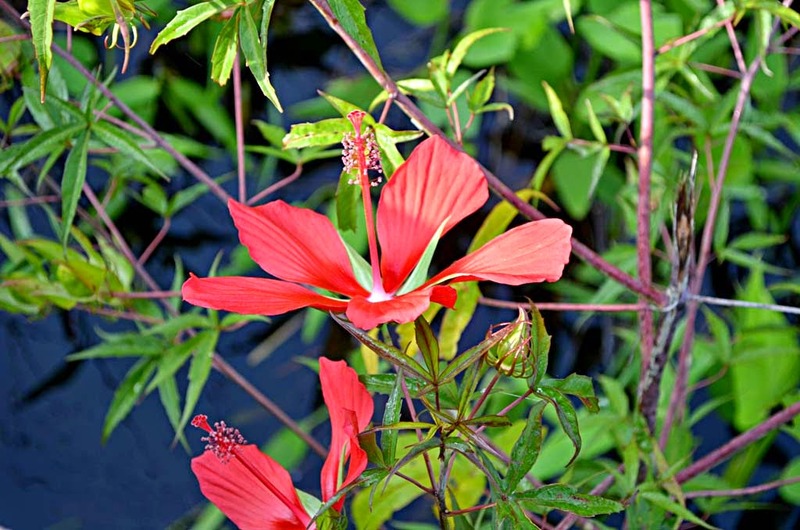 Section 4: Scarlet rosemallows. 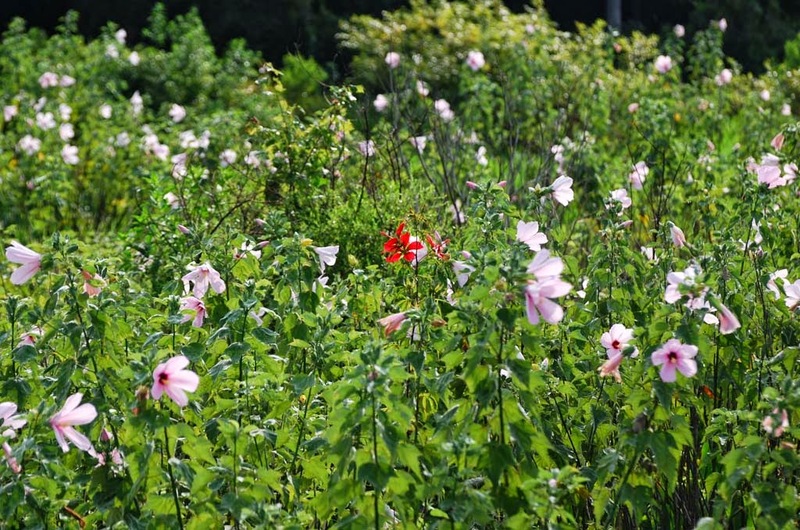 The few bright scarlet faces are vastly outnumbered by the pink swamp rosemallows. 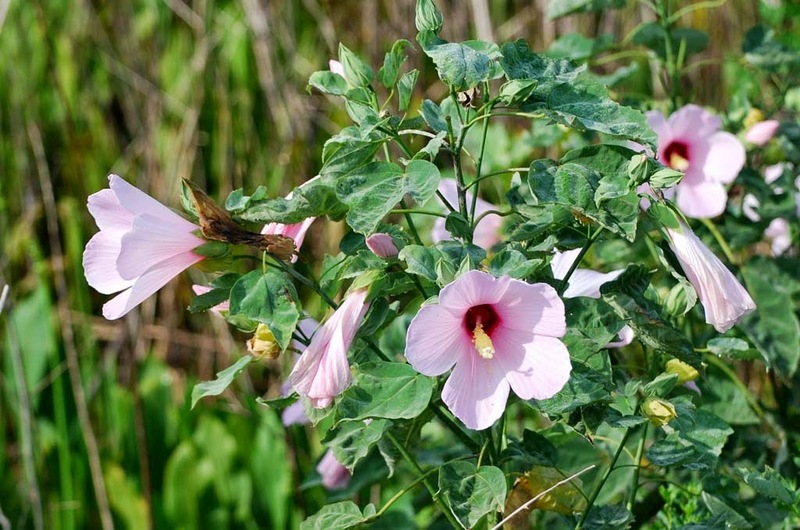 Section 5: Saltmarsh mallows. 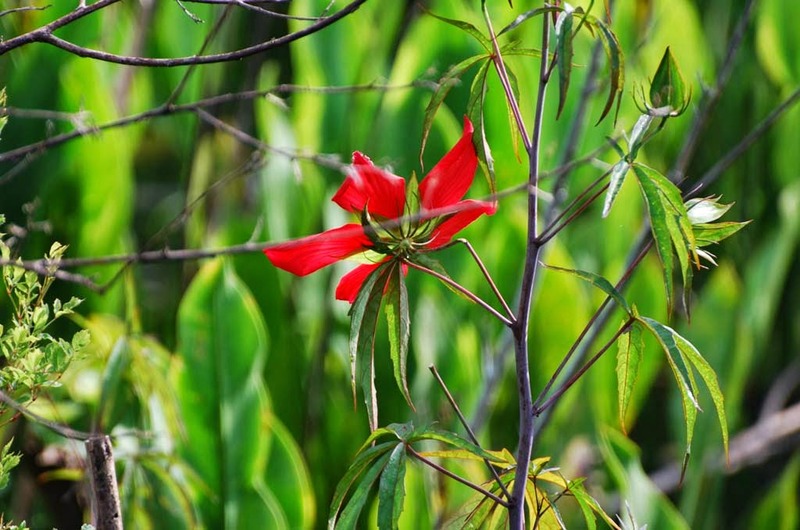 Only a few of these were found along the roadside.